Eighty-seven lumber retailers in southwest Alberta received letters asking them to decline selling Spray Lake Sawmills (SLS) wood from the Crowsnest Forest and instead sell Forest Stewardship Council (FSC) certified wood, until the Castle Special Place is off the chopping block and SLS along with Alberta Sustainable Resource Development have reformed forest management in the Crowsnest Forest through an FSC certification process. The Alberta Foothills Network and volunteers are currently following up in-person with the retailers. Representatives met with the company again last week. Citizens are also asked to check their local retailer and if selling SLS wood from the Crowsnest Forest, to email the Alberta Foothills Network and while at the retailer, to ask them to sell FSC certified wood instead. SLS is the only sawmill logging in the Crowsnest Forest. Its mill is located in Cochrane, west of Calgary. It predominantly uses contractors for road building and logging. “Southern Alberta isn’t short of fence posts or lumber. It’s short of the three big Ws: water, wildlife habitat and wildlands, including for outdoor recreation and tourism,” observes Dianne Pachal of Sierra Club Canada. “Engaging the power of consumers, small and big, through a market action to reform forest management and keep the Castle as a protected area is the best way we figured we could help the two-dozen local business who earlier issued a Tourism and Recreation Industry Advisory about Alberta,” explains Sarah Elmeligi of the Canadian Parks and Wilderness Society. The initial round of public input on a plan for the South Saskatchewan region found the majority of respondents want an end to clear-cut logging throughout the region. They placed tourism and recreation as second only to agriculture for future economic growth in the region and logging last. Surveys revealed that three-quarters of residents local to the Castle Special Place, located at the south end of the Crowsnest Forest, are opposed to clearcut logging in it and support making it a Wildland Park. The Castle has the province’s largest diversity of native plants and animals. It has 223 species listed as rare or as Species-At-Risk of extinction within Alberta (called extirpation). That includes grizzly bears, which are trans-boundary. They are listed as threatened in Alberta and endangered in the U.S.A.
SLS also logs in the Bow Forest, which is located in the South Saskatchewan region, upstream of Calgary. The current market action is not against the sale of wood from the Bow Forest. Dianne Pachal, 403 234-7368, Sierra Club Canada, dpachal@telus.net (Calgary). Sarah Elmeligi, 403 688-8641 (cel.) selmeligi@cpaws.org (Calgary) or Helene Walsh, 780 922-0908, helene_w@telus.net(Edmonton), Canadian Parks and Wilderness Society. Gordon Petersen, 403 627-3732, gordon@diomedea.com Castle-Crown Wilderness Coalition (Beaver Mines). Louisa Wilcox, 406 222-9561 (ex 3), lwillcox@nrdc.org Natural Resources Defense Council (Montana). Nigel Douglas, 403 283-2025, awa.nd@shaw.ca Alberta Wilderness Assoc. (Calgary). Organizations leading the market action under the umbrella of the Alberta Foothills Network include the local Castle-Crown Wilderness Coaltion, the Alberta Wilderness Association and the nation-wide Sierra Club of Canada and Canadian Parks and Wilderness Society. Other organizations such as Rainforest Action Network and the Natural Resources Defense Council are lending their names and communication skills in support. The current market action focuses on the 3,518 square kilometer Crowsnest Forest, and is not against the sale of wood from the Bow Forest. There, the company through an independent FSC assessment firm has completed a pre-assessment to determine if they will enter into an FSC certification process for the Bow Forest. A wallet and a vote – Two of the most effective tools citizens have to bring about change are their wallet as consumers and their vote. 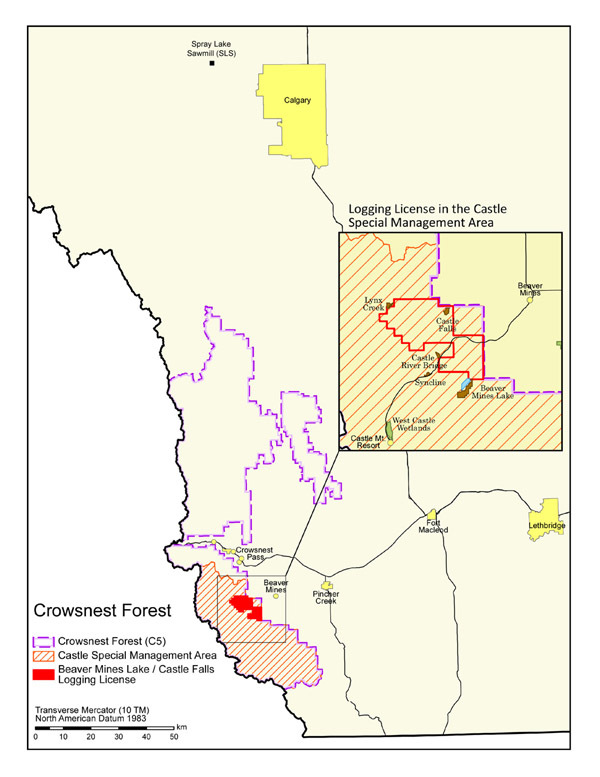 By not purchasing wood products from the Crowsnest Forest, retailers and citizens alike will be encouraging Spray Lake Sawmills (SLS) and Sustainable Resource Development to reverse the Castle logging decision and for the rest of the Crowsnest Forest to enter into a Forest Stewardship Council certification process, thereby changing practices to meet the strict social and environmental standards of FSC. The Castle Special Place is one of Alberta’s 81 Special Place protected areas designated by the province between 1995 and 2001. (It is #40 on the government map and list of Special Places athttp://www.tpr.alberta.ca/parks/managing/establishing.asp#special ) In 1998, the Alberta Government added the 1,040 sq km Castle Special Place as the new Castle Special Management Area “to Alberta’s protected areas network; describing it as “a major milestone in the preservation of Alberta’s natural heritage for future generations.” It remains the only one of 81 Special Places without its protected area status secured by law. Calgary & Lethbridge: A “vast majority” of residents living around the Castle Special Place favor creation of a Wildland Park there and oppose logging inside it, a new survey by The Praxis Group of Calgary shows. The Castle, technically called the Castle Special Management Area and one of the Alberta’s 81 designated Special Place protected areas, is located between Waterton Lakes National Park and the Crowsnest Pass, within Alberta’s portion of the international Crown of the Continent ecosystem and geotourism area. The area surveyed is the southern part of MLA Evan Berger’s Livingston-Macleod constituency and statistically sampled almost half (48 per cent) of the constituency’s residents. Berger is Parliamentary Assistant for Sustainable Resource Development, the government department under Minister Mel Knight, who approved the logging. Of the 774 residents surveyed between April 3rd and 12th, three-quarters (74 per cent) agree with the Castle Special Place Working Group’s 2009 proposal to the Government of Alberta, that the province should legally establish a 1023 square kilometer Wildland Park to better protect the 1041 square kilometer Special Place. As well, three-quarters (77 per cent) oppose plans by Spray Lake Sawmills of Cochrane to block-cut log the area between Beaver Mines Lake, Castle Falls and Lynx Creek starting in June. Block-cut logging is the industry’s term for what is publicly known as clear-cutting. The Castle Special Place is located in the mountainous, public Forest Reserve between Waterton Lakes National Park and on the north, the divide between the Castle and Crowsnest watersheds. Its east-west borders are the Forest Reserve and B.C. boundaries. The province added it to its network of protected areas in 1998 as the new Castle Special Management Area, but special management has not proven effective in protecting it. Hence the recommendation of the working group for Wildland Park legislation, which is in keeping with that already in place and working effectively for the other 80 Special Places. David de Lange, Praxis senior associate who supervised the survey, says he doesn’t find the results a shock. The results are consistent with those from a survey of Lethbridge and Coaldale residents in February by the Citizen Society Research Lab at Lethbridge College. That survey showed more than 85 per cent favor a Wildand Park and are against logging in the area. The Praxis survey asked the same questions. The Praxis survey released late Friday reports more than 80 per cent of respondents are familiar with the area and almost half visit it at least three times a year. As well, 82 per cent say that if a choice needs to be made between watershed protection and recreation opportunities in the Castle, watershed protection is more important. And 84 per cent give the nod to wildlife habitat protection ahead of providing recreation inside the Castle. The Castle encompasses headwater streams for the Waterton, Oldman and Castle rivers. It annually provides an unprecedented one-third of the water for southernmost Alberta. It is also Alberta’s most diverse area for plants and animals, including habitat for 223 listed as rare or as Species-At-Risk of extinction within Alberta. Voting preference makes no difference in majority support for a Wildland Park and opposition to logging, or favoring watershed and wildlife habitat protection over recreation. Numbers range from 67 per cent of Wildrose supporters in favor of a Wildland Park to 89 per cent NDP backers. The anti-logging sentiment ranges from 70 per cent who identify themselves as Progressive Conservative to 90 per cent NDP. The study statistically surveyed residents of the Municipality of Crowsnest Pass, Municipal District (MD) and Town of Pincher Creek, Fort Macleod and the Piikani First Nation’s reservation. It included villages and hamlets in the MD, such as Cowley, Beaver Mines and Twin Butte. Across all communities, the majority supports a Wildland Park and opposes the pending logging. The survey has a margin of error of 3.4 per cent 19 times out of 20, or a confidence reliability rating of 95 per cent. It was commissioned by the Alberta Foothills Network, which includes area businesses and groups such as the Canadian Parks and Wilderness Society and the Castle-Crown Wilderness Coalition. Lethbridge: Lethbridge and Coaldale residents overwhelmingly oppose logging and support establishment of a Wildland Park in the Castle Special Management Area west of Pincher Creek, according to a recent survey conducted by the Lethbridge College Citizen Society Research Lab. More than 85 per cent of those surveyed February 12 and 13 oppose the logging plan approved by provincial Sustainable Resource Development last year. Spray Lakes Sawmills of Cochrane plans to clear-cut the area between the Beaver Mines Lake, Lynx Creek and Castle Falls Provincial Recreation Areas and campgrounds starting in June. The logging is technically called block-cut logging. As well, 87 per cent of Lethbridge and Coaldale residents surveyed support establishment of a Wildland Park in the area, declared by the province in 1998 as one of 81 Special Places in Alberta, but the only one not actually legislated yet as a protected area. A Castle Special Place working group sent a proposal in October 2009 to the province seeking legislated protection of the Castle. The Minister of Tourism, Parks and Recreation commended the work and proposal in a letter to the working group, but the province has yet to act on the recommendations. The survey, commissioned for the working group by the Pincher Creek based Castle-Crown Wilderness Coalition, Canadian Parks and Wildness Society – Southern Alberta Chapter and Sierra Club Canada, also showed more than 94 per cent of residents favor protection of the Castle watershed and wildlife habitat over recreation. The survey found more than half the residents visit the area at least once a year. “People are not unaware of the resource industries. But here, they clearly side with protecting the Castle over that,” says Ellis. Even politics didn’t seem to sway residents in their near-unanimity. Eighty-four per cent of those polled identified their provincial party of choice. Eighty-per cent of Progressive Conservative supporters opposed logging while 82 per cent supported Wildland Park designation. Numbers were even greater for Wildrose, Liberal and NDP supporters. The survey is considered accurate within 3.51 percentage points, 19 times out of 20. The Castle Special Place working group started June 2008 and is a volunteer, consensus-based process of 35 local user-groups, businesses and holders of resource interests in the Castle Special Management Area, as well as adjacent land owners. Prior surveys identified Lethbridge residents as the largest user group of the Castle. The working group is now looking to raise the money needed to run the same survey in Crowsnest Pass and Pincher Creek, which are outside the region the Lethbridge College Lab works with. Report on poll findings attached. 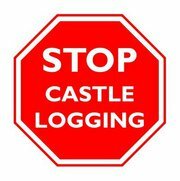 You are currently browsing the Stop Castle Logging blog archives for April, 2011.